Bob the Battle Standard Bearer was taking another report from one of the Reavers who had just returned from another patrol. They were standing in front of a small command tent. "I tell you they saw us, they want us to see them and they led us closer to their camp so we could inspect their camp", said the scout not even trying masking his surprise. "They look like Druchii but at the same time they don't. It is really strange because you could feel the same wild and savage aura our Asrai cousins have around them". He added. "Why did they let you leave then? That's not like Druchii at all." asked Bob trying to understand the situation. "They wanted us to deliver the message of course. Not quite sure what it was though. Their Sorceress, however, waved to us and showed us some kind of a book, with a huge letter "H" engraved on the cover. If I didn't see that myself I would not have believed that at all!" the Reaver was not sure if he should be more amused or worried. Then Larry stormed out form the tent with a parchment that showed a picture of some ancient tome and grabbed the army of the scout. "Was it that book?!" he almost shouted and looked intensely at the warrior face "Was it?!?" "Yes, looks similar but ..." the scout had not time to finish as Larry was already moving away and shouting orders. Outcasts were marching to meet their new foe at once! We planned that game little bit earlier but with 9th Age around and sneak peaks coming every day we also decided to try out Alpha version of the rules plus whatever was added in the sneak peaks on their website. Marchosias initially planned to bring his Peg riders but after reading the rules he decided to come up with something different. One of the main things 9th Age has already addressed (via sneak peaks) is the issue of ridden monsters such as Manticores and Griffons. They are now still large monsters but of a smaller kind. That means that they combine the profile, i.e. you use monster's number of wounds and toughness and the better save the model has. So, Supreme Sorceress has now 4 wounds at T5 and 4+ save due to scaly skin! With healing potion that under 9th Age rules recovers 2 wounds, it is a nice combination that allows the player to use such model without fear of losing the fragile but expensive model too quickly. It can also fight better too, the spells affect whole model etc. Beast magic is also re-worked and I was very curious about it. The new attribute looks very intriguing and I can tell you already it was used to good effect. The same situation is with characters riding chariots so Hag BSB became a very tough nut to crack with her T6 and 5W. I will discuss the Griffon and its equipment later but I also changed equipment for the BSB to try something new. Another big change is about Warlocks (when DE army is considered). They are more expensive, no longer can save against miscasts and are fast troops meaning they don't have vanguard anymore. They still can move fast and are very maneuverable but their abilities from 8th edition are limited. For me, personally, they are a priority to deal with because they are very good at supporting Supreme Sorceress both in terms of additional channeling but also because their two spells are very dangerous. Dark Elf army I was about to face had a very strong shooting. What is more, with long range Bolt Throwers, Shades that can get into good position and fast Dark Riders, I would be in a difficult situation where enemy shooters are constantly dangerous but not easy to get rid of. 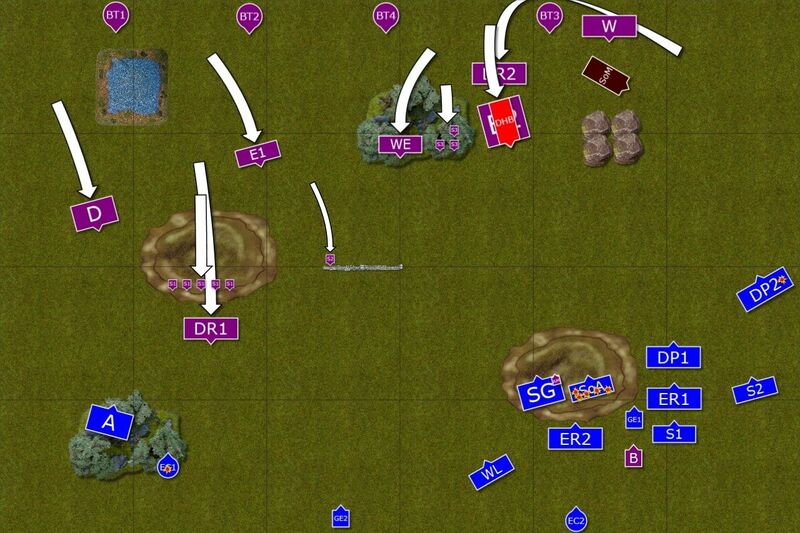 With such choice of shooting regiments the rest of the army could also be more aggressive in its approach and 4 infantry units could all do proper damage against any element I had in my force. They could also maneuver well because the shooters would, in general, be able to pick targets either by moving to the position or thanks to long range. 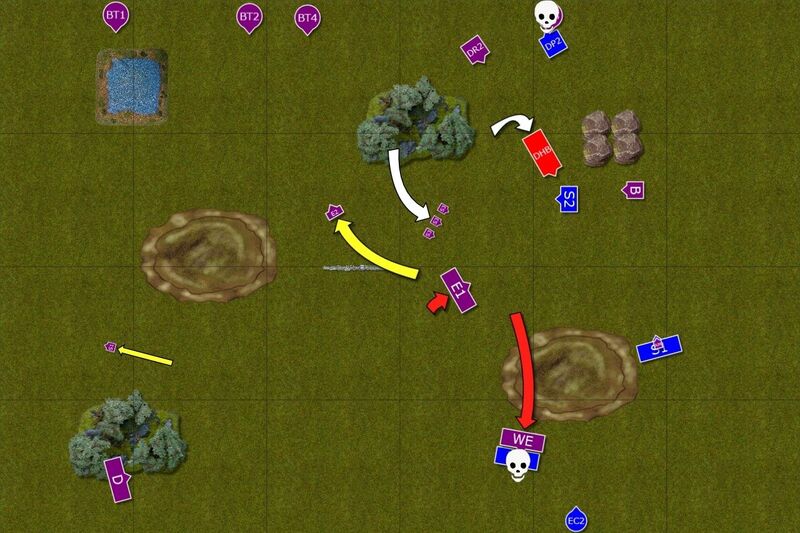 In general, I faced an army that is as good at maneuvering as mine, has a very good shooting, good combat units and advantage in magic too (by that I mean more levels and 2 sources of spells). I chose different equipment for my BSB. I chose it when I thought I cannot really use armor for my griffon rider but apparently, griffon works like eagle in terms of being a mount. That could be still handy if I chose previous equipment, i.e. Charmed Shield and 4++ ward. The difference is, that griffon (or similar) does not improve armor save as eagle does. So I could either stay with 4+/4++ save or try something new. For the game against DE I decided it might be a good idea to try Trickster Helm. It would improve normal save to 3+ but give me only 6++ due to dragon armor. 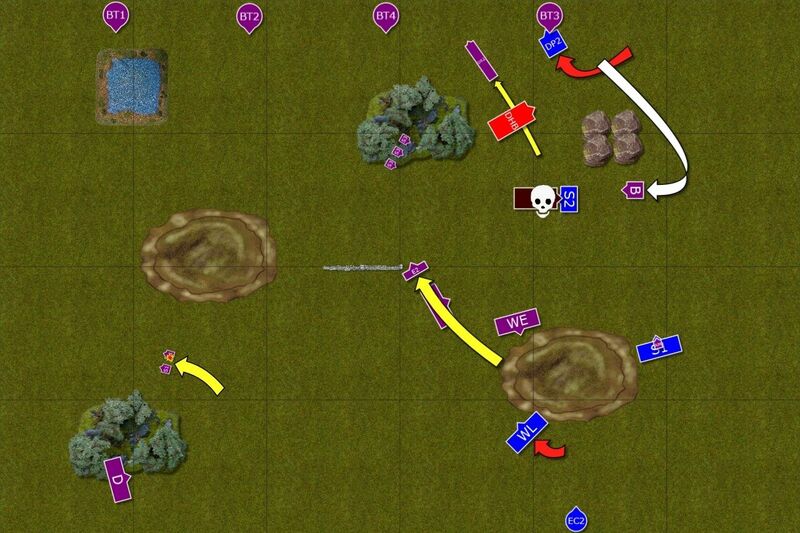 However, with T5 suddenly re-rolls to wound looked very attractive. So I decided to try it out. The games against DE are always bloody. I had to accept that there will be casualties so I needed to make sure I can bleed the enemy too. I wanted to use my own shooting and magic missiles to attack Shades and Dark Riders, provided I had that opportunity. 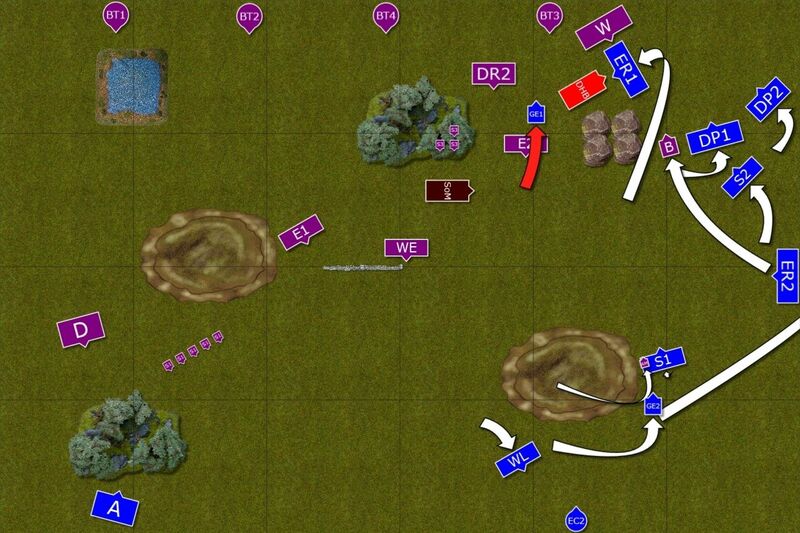 At the same time I knew I need to advance and use terrain to get into favorable combats. 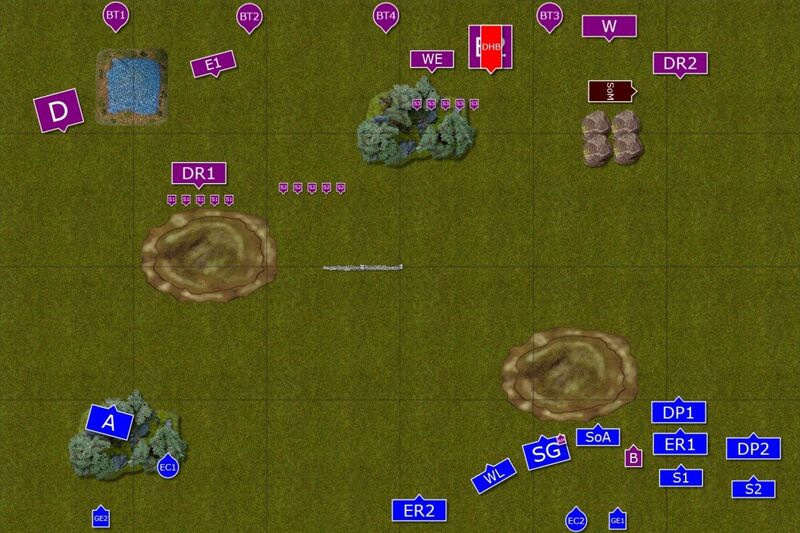 I think I had a slight advantage in close combat but it also depended which unit I could send against each. 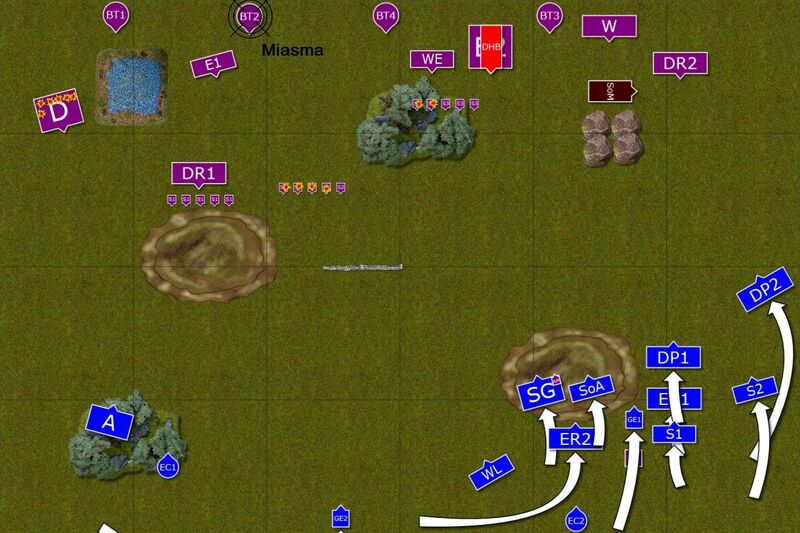 The challenge lied in the fact that every single unit on the battle field had a good counter. For example, Witch Elves are vulnerable to fire and Dragon Princes are the best unit to send against them. But as soon as I lead the cavalry towards Witch Elves the enemy shooters would aim at small heavy cavalry and would delete them before I had a chance to attack. Swordmasters should prevail against Executioners but would be at a disadvantage if Dreadspears blocked their way and so on. 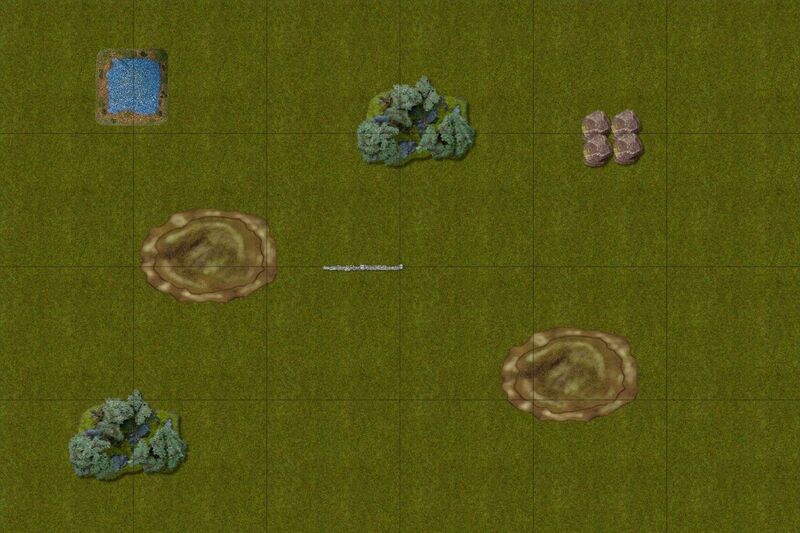 For the terrain Marchosias rolled ETC map (I think it was number 1 from this year) but we used 9th Age rules for terrain and Line of Sight. Basically, Hills and Impassable Terrain (the Rocks) block Line of Sight, Wall provides hard cover, while water and forest force dangerous tests for cavalry. The Amber Spear - casting values 9+/15+; range 24", Hex, Missile, Damage, Instant; Target suffers 1 strength 6/10 hit with multiple wound (D3/D6), no armour saves allowed. Penetrates ranks like bolt throwers. The Curse of Anraheir - casting values 10+/13+, range 36"/72", Hex, Temporary, Target has -1 to hit (shooting and close combat), and treat all terrain (including open ground) as dangerous terrain, and fails dangerous terrain tests on 1 and 2. As you can see there are some interesting changes to the Lore of Beast. The lore attribute in particular can turn units into killing machines. Imagine Wild form and Lore Attribute augmenting a unit at the same time. Transformation of Kadon is great because now you are getting an aspect instead of trying to get the monster in some tight situation and it can be cast on something else not only the caster her/himself. I think Marchosias had very versatile spells to cast with Sorceress herself and even more so with the aid of Warlocks. Larry was about to face a tough adversary for sure! Outcasts seized the initiative and started their outflanking maneuver. Sea Guard and Sisters jumped on the hill to start shooting at the enemies but the Shades were well hidden. 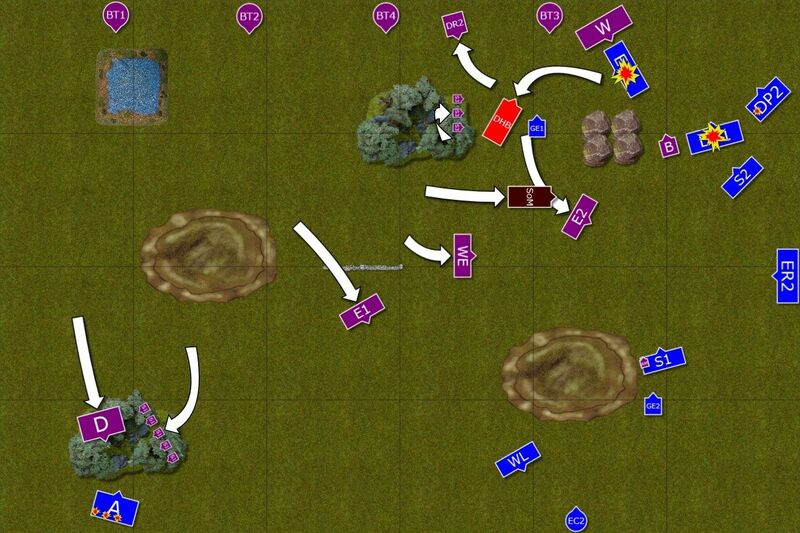 Only a few of them died and it looked like the bold opening put some of the Elven units in very dangerous spots. Druchii shooting is not yet as efficient as it could be. Dark Elves advanced too, it seems their savage nature was taking over and they didn't plan to wait for their enemies to come to them. They also had the means to hurt their foes at a distance. Sisters of Avelorn took the brute of the attack but it was not as efficient as it could have been yet. High Elves pushed through the flank harder, now baiting their enemies to charge some of the regiments and to counter in order to get behind their lines. The shooters finished off now exposed Dark Riders and last Shade hiding behind the wall. However, the disaster struck when Larry the Loremaster could not contain the magical feedback and half of his Sea Guard perished in flames. Where PDU = Power Dice Used. It means that all models under the template got hit with Strength 5 + 2 = 7, the Loremaster got wounded with no ward saves either and I lost 8 Sea Guards. In addition 5 dice were immediately removed from the pool meaning I now had only 2 power dice against 7 for Marchosias. I didn't bother casting more spells this round. Dark Elves moved forward again and exploited the situation where some of the High Elf regiments were already weakened. The shooters focused on Sisters and Sea Guard and both units were completely destroyed, with lone Loremasters standing on the hill now. 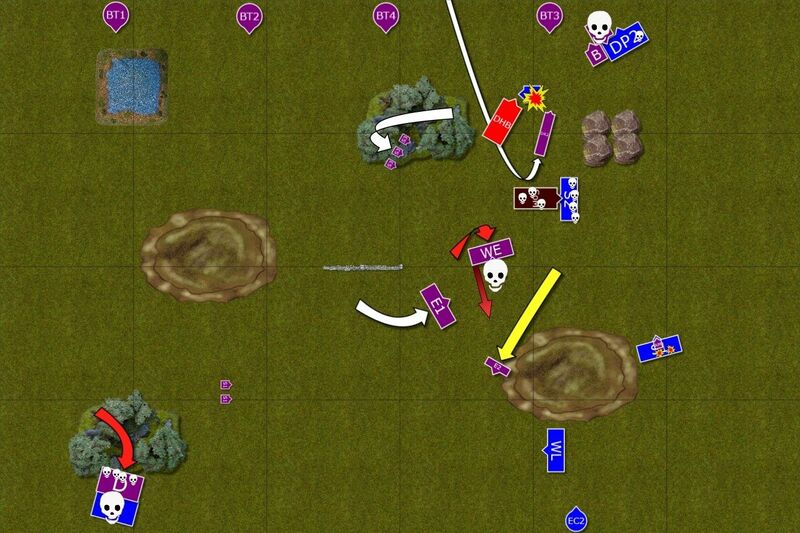 Fortunately, Dark Elves had to reload and he had time to run for cover. On the left flank things didn't go well for the Outcasts either as Shades destroyed Bolt Thrower and nearby Archers panicked and abandoned their positions in the forest. Dark Elves clearly got the upper hand. 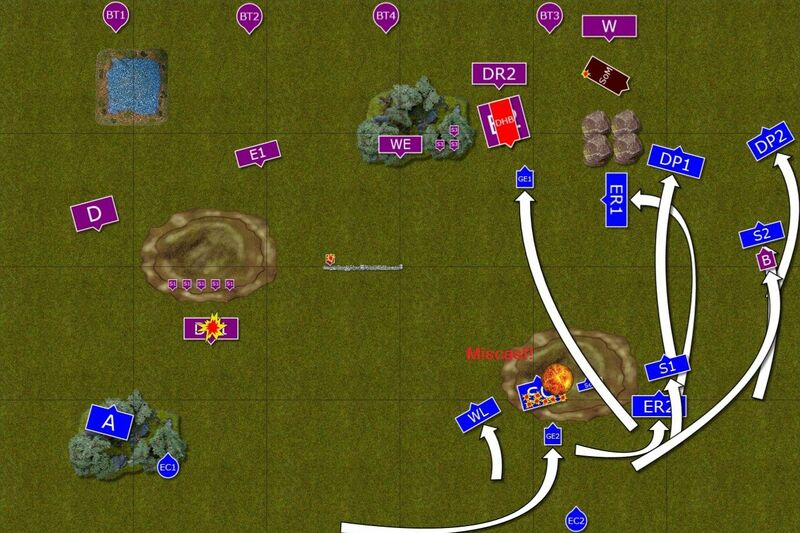 Despite heavy casualties High Elves kept moving forward and regrouped on the march. With the Archers rallying and other long range shooters gone Outcasts could not do much at the distance. Would they be still able to fight back? Outcasts lose more units, situation looks grim. Dark Elves didn't take an obvious bait and withdrew. They used their ranged attacks to further thin down High Elves battle line and they were very successful. Regular shooting eliminated Reavers while magic Amber Spear skewered entire Claw of Dragon Princes! Things started to look even more grim for the Outcasts. It was now or never. Outcasts were wounded badly and they needed a counter attack to keep any hopes for surviving that battle. Bob called for the aid of Dragon Princes and together they charged the Warlocks. Three of them fell but remaining two held their ground nevertheless! Swordmasters and Eallyrian Reavers all charged in against exposed Executioners who arrogantly held their ground. Only Larry's bodyguards were late to the party. Outcasts hit hard but Reavers had to take the attacks back and none of the valiant fast cavalry survived. But they occupied Executioners long enough so that flanking Swordmasters broke them and overrun into nearby Sorceress! 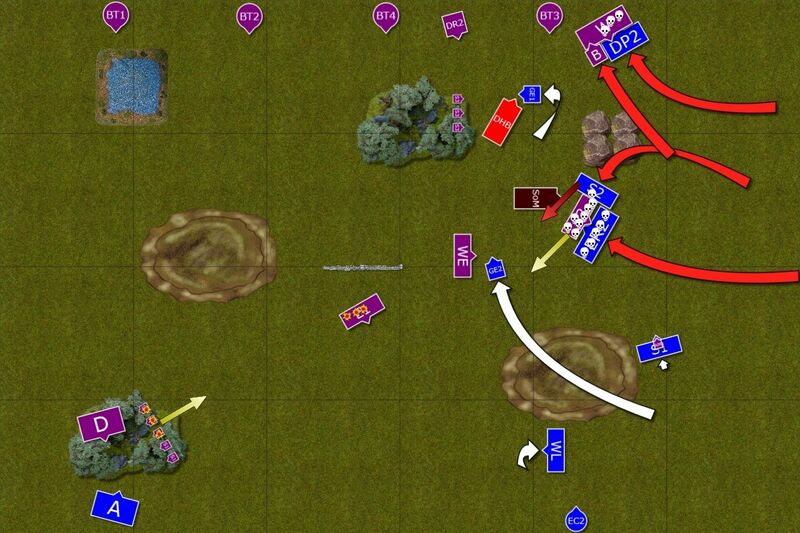 Archers tried to fend off surrounding Dark Elves and even managed to panic the Shades. However, they still had to face Dreadspears! Is it a killing blow to Outcasts army? Despite successful charges, Outcasts were not out of the trouble yet. In fact, Dark Elves pushed further and Dreadspears broke the Archers ([i]Edit: I lost just enough models to lose steadfast![/i]). Fortunately, BSB and Dragon princes finished off the Warlocks and had a clear path to charge new targets while Swordmasters left the Manticore barely alive and there was no reinforcements coming. Would they be able to capture the Sorceress and go back to the game? Outcasts tried to press the attack but not all went according to the plan. Dragon Princes attacked exposed bolt thrower but managed to kill only one crew member while the other one refused to flee. Fortunately, nearby Hag directed her cauldron elsewhere as she decided it is beneath her to fight such an insignificant foe. Elsewhere, White Lions were so eager to catch fleeing Executioners that they didn't hear their general and didn't attack exposed flank of another, still intact unit. Fortunately, Swordmasters managed to kill the Manticore and capture the sorceress! Larry the Loremaster was so happy because of this turn of events that he completely failed to cast spells this turn! Witch Elves spotted the Lions and charged in. Warriors of Chrace seeing a bunch of half-naked and crazy women started to retreat but strangely they withdrew in the manner that suggested they actually wanted to be caught! Dragon Princes finally destroyed first bolt thrower and reformed looking for new targets. Dragon Princes, desperate to pay back, charged Dark Riders who fled to the forest and never came through to the other side! (Edit: Two failed DT tests, Ouch!). 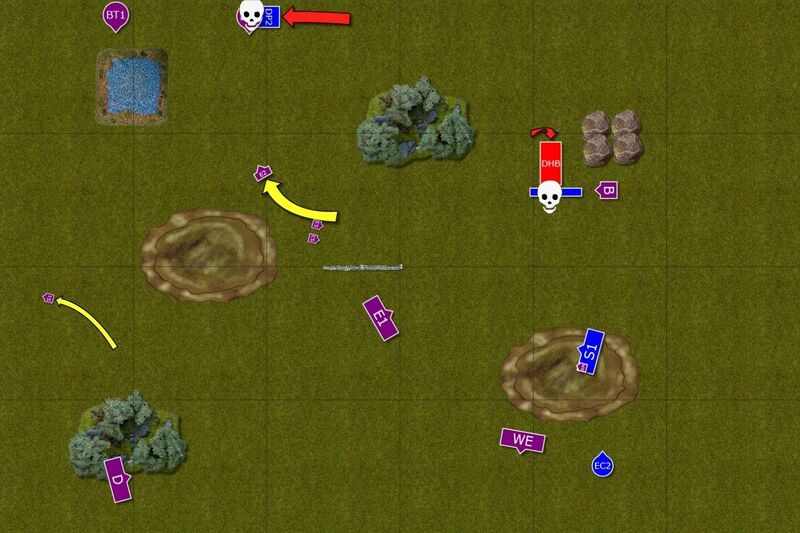 Elven Knights expertly changed the direction of the attack and without losing the momentum hit another bolt thrower. What is more, they carried their charge into third war machine! Bob the Battle Standard Bearer tried to catch Shades and Executioners but both units didn't want to fight against him alone and fled too. Finally, Larry the Loremaster one last time tried to cast some meaningful spells but once again he failed! Two fleeing units rallied and two kept running away. Swordmasters sacrificed themselves to stop the Hag and paid ultimate price for it. Dragon Princes finished off third bolt thrower and were about to catch the last one but the horns sounded the withdrawal. Both armies were heavily bloodied but none could claim victory this day. "All this just because of some book, Larry? ", Bob was not sure if he was more furious or more disappointed. "Not "some" book, Bob. It is my signed copy of Book of Hoeth, hand written by Belannaer himself! Not some cheap copies Goblin traders sell everywhere these days", replied Larry. "They are not even Druchii! They are The Lost Colony, Larry, the people we read about in chronicles and you almost destroyed them! ", the veteran didn't want to let the subject go, "You are not one of these hot headed Caledorians who first fight and then ask who did they attack. How did you lose that book and how did she get it in the first place anyway? ", Bob continued what was probably the longest speech he has ever had. "Ah, well, you know ..." Larry looked suspiciously shy "we were in the same group at White Tower when I started my studies. She tricked me, took the book and I have never seen her again." "Well, at least you will know from now on how to cast spells!" said Bob and left the tent to cool down. Larry looked deeply hurt. First of all I would like to thank Marchosias for a great game! Even when I was losing units it was a fantastic challenge to claw my way back, Marchosias was a very sporty opponent all the time and we had a great time for sure. To my surprise we lost almost the same number of points! (Marchosias beat me by around 20 points :)) I think it is the new rule of giving half points for fleeing units and big bonus for the Sorceress that helped me to save the game. I think my first mistake was to push LSG and Sisters forward too early. I didn't have good range yet, many potential targets were not available and others had additional protection. I should have moved SG on the slope only so that I could benefit from cover for the purpose of spells casting. Another mistake was to position left Bolt thrower too close to the archers and force the panic check. I am still not sure if positioning these two units there was a good idea (or rather why not reinforce them with something) but that would have helped for sure. One more shooting round or freedom of movement would have been great. I am glad I spotted some opportunities to bring the fight back to the enemy, in particular the one where I got the Executioners and overrun into the Sorceress. That definitely saved me the game. However, I feel I didn't maneuver well with the rest of the army and Lions and Swordmasters with Larry did nothing this time. I should have used them more aggressively or at least support each other. There were a few other mistakes, like not positioning Swordmasters with the Loremaster well enough to be able to see the flank of Witch Elves. I face 6 poisonous attacks but I think I would be able to inflict enough casualties to overcome that and with some spells I should have been able to get them. Or am I too confident here? :) Of course I didn't create the best opportunity to attack them with Dragon Princes or BSB for that matter, since both have ward save against flaming attacks while witches had the Banner of Eternal Flames. I wonder how should I use my last chance to get points during the 6th turn and magic phase. 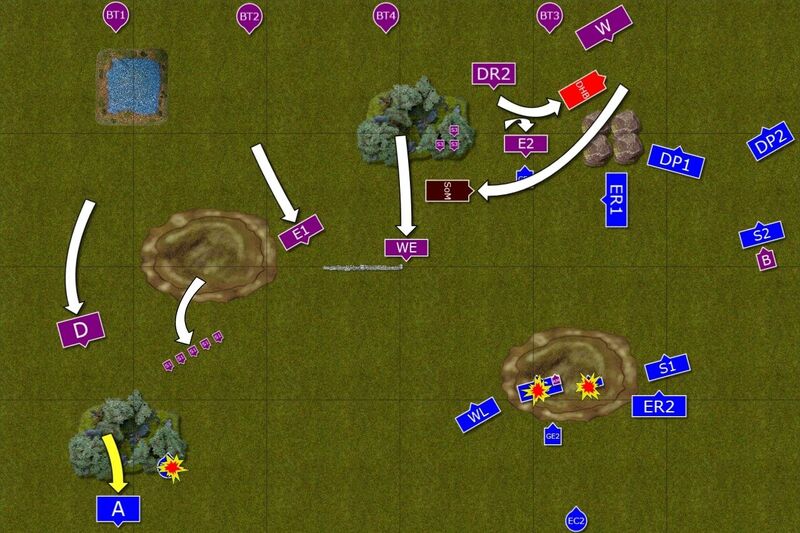 I failed to inflict proper damage where I had a chance to destroy 2 units. I hoped I could destroy at least fleeing shades and exacutioners as there were 5 models total there. But with 6 dispel dice Marchosias was in a good position to dispel my attempts. Looking at it I would probably go for 3d6 Burning Gaze, followed by 3d6 Fireball (maybe 2d6 version) and just try that Searing Doom at executioners again. Not perfect but might work better. But other than that I need a better overall plan as I was losing the game due to my mistakes in the first place. 1. 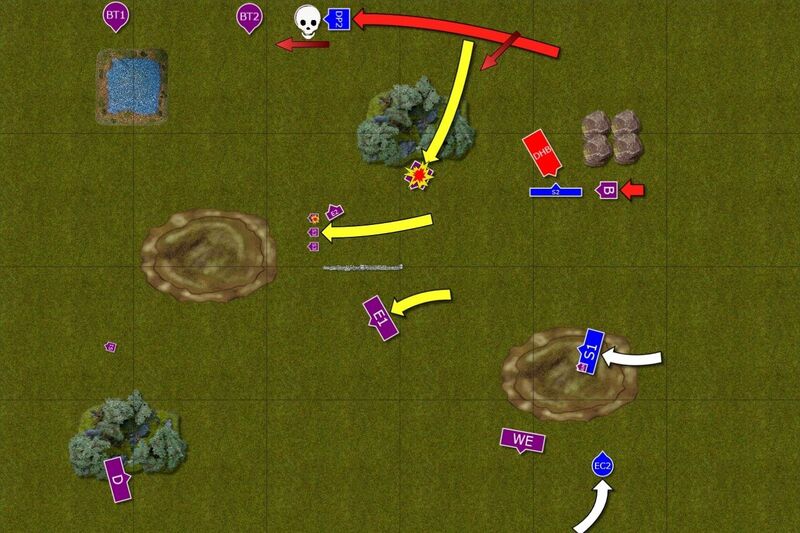 Line of Sight - in our game the rule that defines the size of a model and based on that one can tell what is seen is very good. In particular on UB where you can't judge what is what really. But even in real game I would like that as it simply makes it much easier to play with. You have to get used to it and stop assuming you can see anything but I like it a lot. 2. Ridden Monsters - it was great to see Griffon and Manticore again. I started using Griffon some time ago but I like the new approach. These medium sized monsters will have a role to play I think. They are not particularly tough but still much better protected. And I think they will finally find their way back to the armies and augment fantasy aspect of the game. I can also tell you that next report will feature an Archmage on Star Dragon that will showcase the bigger ridden monster and how the new rules affect these Monsters!